Ed and Martha Jonas, 1988. Professor emeritus Edward Jonas passed away in January 2014. In lieu of a memorial, which, we offer this edited version of remarks written by Leon Long on the occasion of Jonas’ retirement in 1988. Professor Edward C. Jonas retired from active teaching in the Department of Geological Sciences in May 1988. His entire professional career as a geologist, thirty-four years, was accomplished in this one department. Ed was one of the few UT-Austin geology professors who was actually a native Texan. He was born in San Antonio of parents whose roots went back to Germany and France. Early experiences, neither sought nor expected, helped channel Ed’s career into its unique direction and style. Perhaps the most important was his contact with one of his grandfathers who was a diamond merchant. Even if Ed’s love of minerals may not have been genetic, his childhood discovery of gemstones made a big impression on him. Years later he was to design and teach a very popular university course in gemstones. Ed did not start out as a geologist. His B.S. degree in 1944 was in chemical engineering from the Rice Institute in Houston (now Rice University). The enthusiasm of one of his professors, an authority on the subject of colloids, was influential in steering Ed toward his eventual specialty, the study of clay minerals. But first there was a stint of active duty in the Navy during the later war years. Ed left the Navy as an ensign in 1946, lectured in physics briefly at the University of Houston, and found a job as chemist for the Shell Oil Company where a good friend and mentor was doing research on clay minerals. Despite such close encounters with earth science, in the timescale of Ed Jonas these were all events in the Pregeological Era. About this time, Ed married Martha Sullivan. After a glorious (Ed’s emphasis) summer of honeymooning in Europe, they settled down to a long, stable family life and had three children. 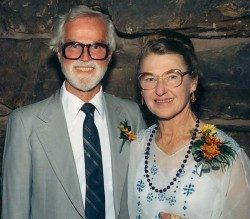 Ed and Martha were an extraordinary couple who put much effort into filling their home with charm and beauty. In 1967 they trucked a dilapidated old house in pieces out to Manchaca, south of Austin, and went on to spend years restoring it to be like an authentic Texas farmstead of the last century. Their home contains the amenities of gracious Southern living: an outhouse, eight fireplaces but no furnace, wood-burning stove, butter churn, and an antique piano. It was a fascination with clay minerals that attracted Ed Jonas to the University of Illinois where he received his M.S. (1952) and Ph.D. (1954) in association with Ralph E. Grim, his major professor. During part of this time he worked for the Illinois State Geological Survey. Ed was an eager but very green, beginning graduate student when he traveled to his first scientific meeting. There he met Professors Ellison, DeFord, Flawn, and Bell who were to become his close associates. Professor DeFord characteristically launched into a discussion of entropy and Fourier synthesis, subjects that a clay mineralogist should know something about. But an experienced clay mineralogist and a young graduate student are not the same thing. Professor DeFord had Ed absolutely terrified! Shortly after completing his Ph.D., Ed was to have another scary experience. Upon his arrival as an assistant professor at the University of Texas in 1954, he began to teach the introductory course in physical geology. When one who has had no teaching experience is suddenly thrust into an auditorium facing 250 students, that is an exercise in terror. Ed introduced courses in crystal chemistry, x-ray diffraction and fluorescence analysis, mineralogy of shales, and gemstones. In a department with many students but no surplus of professors, he eventually taught nearly every required course in the B.S. curriculum. Ed Jonas was an expert in the crystal chemistry of clay minerals. His publications addressed such subjects as the post-depositional alteration of clay minerals, which led to interpretations of how and why the clay minerals in recent and ancient sedimentary rocks are different. His research focused on both the theoretical and applied aspects of the subject. He has studied the bentonites of Texas and South Texas uranium ore deposits. He was the Department’s first recipient of an NSF research grant. He was a charter member of the Clay Minerals Society, in which he has been twice elected to council membership, and for six years was treasurer. Industry has also recognized and rewarded Ed’s expertise. He has been a long-standing consultant to companies that mine the raw materials kaolinite and other clay products. Ed Jonas, like all geologists, is basically an adventure seeker. And what better way to have adventure than to travel to remote parts of the earth? Ed and Martha look back with nostalgia on his Fulbright-sponsored 18 months in New Zealand. Other adventures don’t hold such fond memories. While Ed was attending a Geological Congress in Prague, the Soviets invaded the city. His trip to Iraq was cancelled when war erupted in the Middle East. One can soon gain a reputation as a harbinger of bad fortune this way, and Ed has kept a petition from 1968, signed by 48 members of the Department, asking him please to stay home next time! One of Ed’s chief pleasures has been his many years or contributing to the general welfare of the Department. After Steve Clabaugh retired, Ed continued to upgrade the Barron Collection by negotiations that added to it many valuable gems and gem quality minerals. He was the graduate advisor for an amazing 11 years, at a critical time of growth and development of the Department’s graduate program. Ed was especially fond of working with the undergraduates. He sponsored the Undergraduate Student Geological Society (our local version of USGS) for 12 years, during which period he led many mineral-collecting field trips to Mexico and elsewhere. Students loved the enthusiasm he showed as he introduced them to the mysteries of geology and of gemstones. Professor Jonas, you served us long and well. We are grateful, and we thank you!